The ad was offering two dollars off a steak. Only two people ever took them up on the deal. Safeway’s lawyers claimed that Jordan should be paid $126,900 for this slight. Jordan’s lawyers were asking for $10 million. Jordan won, like usual, and the jury awarded him $8.9 million for his troubles. He plans to donate the proceeds to charity. Post-playing-career Michael Jordan will never be as interesting as Michael Jordan the basketball player. He doesn’t need to be. I don’t need him to re-create that same excitement. I don’t think anybody does. I liked watching him do incredible things on the basketball court, but as I get older it feels like I might actually like remembering those things even more than I liked watching them as they happened. I don’t need Jordan to be what he once was. You know what I need from Jordan now? I just need him to be there. I just need him to be. I can’t think of a time when Michael Jordan was not a big figure in my life. I realized that last week. My whole everything, as far back as I can remember (somewhere around 1992), there’s Jordan. He’s occasionally directly involved with a core memory, but if not that, then he’s somewhere off in the background, hazy and barely recognizable but recognizable nonetheless: player, retiree, logo icon, team owner, Internet meme, all that. I like Michael Jordan. I care about Michael Jordan. That’s why I made the paper doll below. It was inspired by what he said at the hearing. I read that he values his image preciously, and I laughed because he wears terrible clothes now. Maybe it’s not as precious as he thinks. I know that’s petty, but it’s true. So here’s the paper doll. 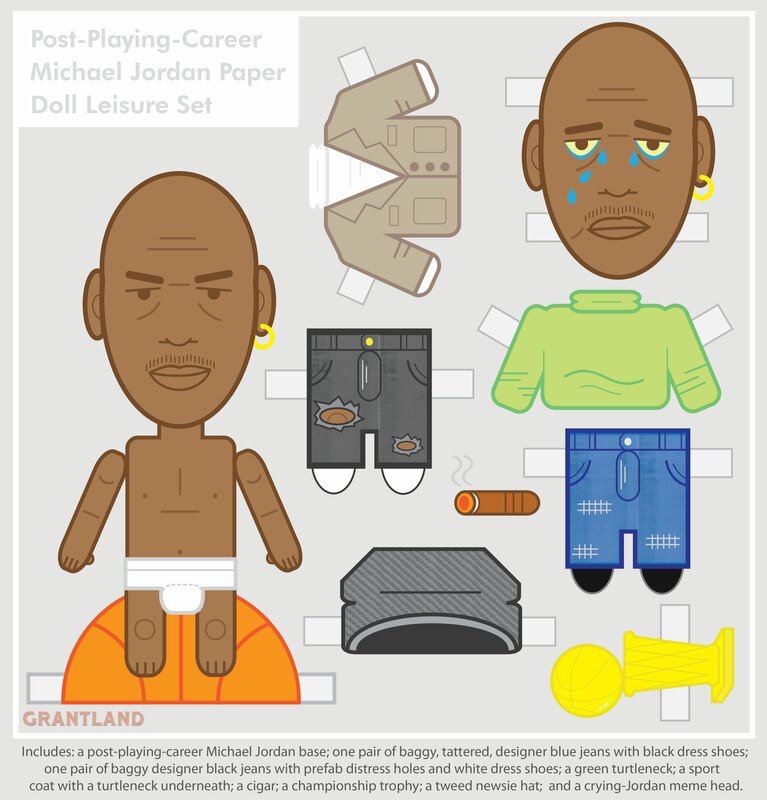 It’s the Post-Playing-Career Michael Jordan Paper Doll Leisure Set. It has all the stuff you need to be the current version of Michael Jordan. If you print it out on card stock, it works out the best.